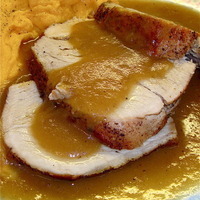 Leaves turning, cooler breezes blowing - time for a comforting pork roast with onions, apples and hard cider. This is a deceptively simple dish that Claire Robinson turned me on to, and is loaded with country flavors. The hard cider reduces down to a savory sauce after Granny Smith apples and sliced onions are caramelized. A very nicely browned pork roast then gets parked in the center of the pool to roast to perfection. A minute of puree action with your wand or blender, a knob of sweet butter and the sauce is reduced to a wonderful gravy. This is a dish we serve with our Garlic Herbed Sweet Potatoes, a side of kale sauted with bacon, red pepper flakes and red wine vinegar. Biscuits with Pear Butter and a fruit dessert round out the meal. Let it snow! I love the flavors. I promise to try that soon! This was a feast of flavors. Will make again....and again. The apple/onion/cider gravy is worth the time alone to make! And completing the feast was your Cajun Bread Pudding with Praline Sauce. "Dinner by Amos" - perfect! Amos: I made the dish last night for a group of six. All at the table enjoyed the meal; even two picky eater grandkids. My wife loved the apple, onion and cider sauce/gravy. I had some extra cider so I used it in Brussels sprouts/baby carrots browned in a skillet then reduced the remaining cider until almost gone and added cold butter. We also had garlic mashed potatoes and a mixed salad. A nice meal. Thanks for sharing! Annie - HARD CIDER is just that - hard. It has, generally, a 5% alcohol content and is about like a strong beer in alcohol content, but it is an apple beverage, fermented by the addition of a yeast (Doc's uses champagne yeast). I use a brand named Doc's Draft. A well-stocked liquor store will have a few hard ciders, but I recommend an American-made brand, made without the addition of 'flavors', like vanilla. This would be similar to using a wine product and making a reduction sauce, but the alcohol content is much lower. A regular cider or apple juice would simply be too sweet and wouuld not serve you well in making a sauce. And, of course, all the alcohol does cook off, evaporate, as the dish is in the oven. All that remains will be an exquisite flavor. I hope you can try it! Great to hear from you. Be well. Isn't it about time for you to bake my Swedish bread recipe??? Amos- Thanks for the reply. I meant to ask how many ounces of Cider was in the bottle; as you didn't mention ounces in the recipe?. I just bought a 6 pound boneless loin roast which I cut in half. I have plans for the first half. This looks like a great candidate for the second half. Something about pork and apples. A match made in Heaven. I have added it to my Try soon folder. Thanks for sharing!